Well, hello! I'm terribly sorry for disappearing for the past few weeks. I wrapped up the summer with a week-long vacation in Napa/Sonoma, my favorite place in the US. And I'm so excited to return back home to September - or "birthday month" as we call it in our home. My husband and I have birthdays 11 days apart and (now that I've learned to share) we love celebrating for a solid 2 weeks straight. So of course that means you can expect a lot of birthday festivities highlighted on A Bar Cart in Brooklyn this month! I'm working on a masculine bar cart design with the help of Susty Party that I can't wait to share with you. I'm also co-hosting our local Dumbo CSA's end-of-summer potluck. And I'll be attending an Outstanding in the Field dinner for the 2nd year in a row! Tomorrow I'll share with you some photos and details from a royal purple & British candy-filled birthday party I threw for a friend last month. 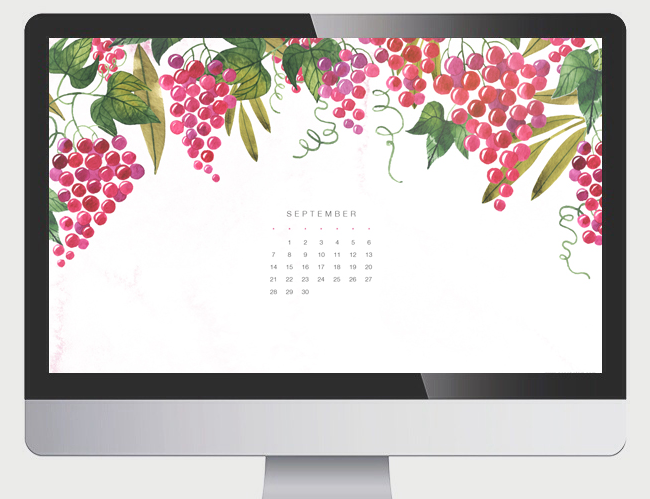 Here are a few desktop & mobile backgrounds for September. As always, click the links in the captions to go to the designers' sites to download.